According to a report recently published by The Economist The rise of the marketer: Driving engagement, experience and revenue CMO’s have discovered a global shift with regard to who is in the lead in customer experience. What is causing this shift? And is this shift also taking place in the Netherlands? 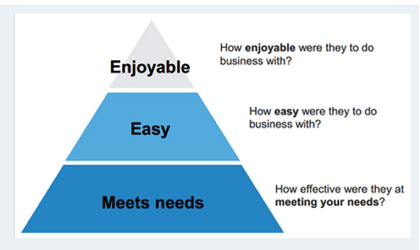 Marketers in this international research note that almost everybody in a company has touch points with the customer at some point in his/her journey. This ranges from the financial department to customer support. They have also noticed a shift in responsibilities: over 33% of the respondents indicated that they have responsibility for the total customer experience within their organisation. Marketers believe that 75% of the marketers will be responsible for the total customer experience over time. It is remarkable that they expect to gain more responsibility, whereas customer support and sales will be losing this. Holistic or not, who is in the lead? One of the explanations for the shift to marketing could be that to reach the customer, marketers need more of an overview on what is happening cross-channel, cross-product and cross-business. Another reason that marketing shows this involvement in customer experience, is that only when all customer touch points are in perspective, can we really follow the road to engaging with the customer. Up to a few years back it was all about content marketing, now it is becoming more apparent that content is a tool to reach engagement and not the goal itself. Engagement is becoming increasingly important once the prospect has become a customer. In a survey by The Economist, marketers responded that engagement happens during contract renewals, customer retention and repeat purchases. In brief, it seems that marketing can take the stage where customer experience is concerned at several stages. Years ago Forrester Research proved the importance of customer experience with the Customer Experience Index (CXi), a benchmark that offers insight into which companies score well on both customer experience and on long term revenue. How enjoyable were they to do business with? How easy were they to do business with? How effective were they in meeting your needs? 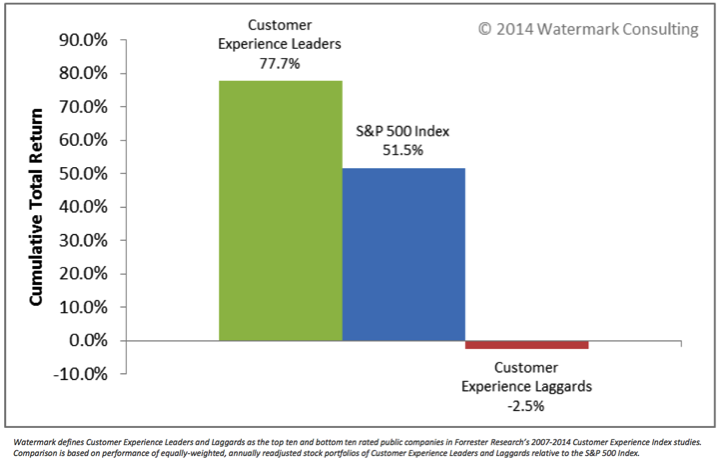 Jon Picoult, a consultant at Watermark Consulting, keeps up with Forrester and compares two groups annually: the ‘customer experience leaders’ and the ‘customer experience laggards’. It is great to discover that on the stock market the ‘customer experience leaders’ have left the ‘laggards’ trailing behind during a period of seven years (2007-2013). “Leaders outperformed the broader market, generating a total return that was 26 points higher than the S&P 500 market index. Laggards trailed far behind, actually posting a negative return during a period when the broader market rose sharply.” Read the full report here. Customer experience – the complete package of experiences a customer has during his relationship with his supplier – is becoming more and more important in standing out in the market. By creating a personal, memorable experience, companies can retain customers and turn loyal customers into advocates. Marketing was an early advocate of the importance of customer experiences. Now we seem to be taking the lead in this as well, at least if we are to believe The Economist. How the ball game will be played is yet unclear, but shall become apparent in the coming years. I have understood that B2B companies are undergoing a definite transition from focusing on lead generation to focusing on engagement. To really engage with your target group, you need to take hold of the customer journey and the customer experiences that go along with it. Isn’t that a great assignment for marketing? Who will be in the lead, shall yet be determined, but that should not keep marketing from making the first step and waking up the executive board. Interested in mapping the customer journey? Let me know, I’d love to share our insights with you. Note from the author: In part 1 of this series I wrote about ‘The new marketer: marketing no longer a cost carrier’.